SkyFi III is WiFi-to-Serial/USB adapter, designed for wireless telescope control. If you have a computer-controlled GoTo telescope, with the SkyFi III you can use your computer or your iOS/Android device to point your telescope in the sky. SkyFi III is the only WiFi device on the market specifically designed for telescope's mount control, and it now includes a built-in rechargeable lithium ion battery for up to 12 hours of field use! SkyFi III includes both USB and serial ports - this means that it can control the latest USB-only telescopes as well as other telescopes with RS-232 serial interfaces. Once powered on, SkyFi III creates its own wireless network. Join this network from your mobile device, laptop, or other computer, and - voila! - you're ready to use SkyFi III. Use your existing telescope serial cable and plug directly into SkyFi III - you don't need to buy (or build!) another. Finally, you'll also need a telescope control application running on your computer or mobile device. SkyFi III works seamlessly with our SkySafari apps for iOS and Android devices, our SkySafari software running on Mac OS X, and our Starry Night software on Mac and via Virtual Serial Port on Windows. Market Leading: SkyFi, patent-pending WiFi-to-Serial adapter, is the only WiFi device on the market specifically designed for telescope's mount control. Battery Powered: SkyFi is battery-powered for field use and it has a battery life of 8 - 12 hours under continuous use. Easy Set Up: SkyFi requires no pairing, and no special drivers. It uses standard TCP/IP networking protocols and enables your telescope's mount to be remotely controlled. Telescope Compatibility: SkyFi can wirelessly enable almost any Go-To telescope with a standard USB or RS-232 serial interface. All you need is the telescope-to-computer cable supplied by the manufacturer. Compact Size: SkyFi is very compact, barely larger than an iPhone. It can be easily attached to your telescope's mount or tripod; a strip of double-sided Velcro is included for that purpose. SkySafari Integration: SkySafari Plus and Pro apps, for iOS, Android and Mac OSX, are specifically designed to communicate with SkyFi and your telescope over a wireless connection. Technical comment by Filippo: "SkyFi III is not only the best solution to remotely control various mount (like SkyWatcher with SynScan or Orion ones) with WiFi but it's also perfect for EAGLE CORE. In fact you can control telescope position fron one app (like SkySafari) to align and slew it to the object you want. Then you move to EAGLE CORE app to start autoguiding and images capturing!" SkyFi III allows you to control telescope mount (instead of using telescope's handpad) using many different softwares. It's the perfect companion with SkySafari app (available for iOs and Android) that is not only a very powerful planetarium software but that also have all the telescope control features. You will be able to connect to the telescope mount, align the mount to the stars, automatically slew to selected object, move the telescope position, check for the eyepieces or the camera field of view and much more! The baseline requirement for Celestron support in SkySafari 4/5 is Celestron firmware version 4.0 or higher, which is basically everything sold since 2008. This excludes the older Nexstar GT series, the original Celestron Nexstar series and the Celestron Ultima 2000. The only models that do not work with SkyFi III are those that have neither USB nor RS-232 serial ports. Such models include Vixen mounts with StarBook controllers. SkyFi III is very compact, barely larger than an iPhone. It can be easily attached to your telescope's mount or tripod; a Velcro belt is included for that purpose. SkyFi III has a micro USB connector for external power. It can be powered or charged from a standard 5V USB port on your computer. 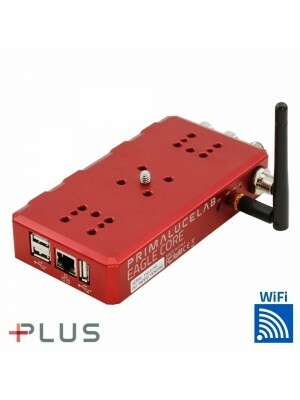 The package includes a micro USB power adapter that accepts worldwide AC current (100-240V, 50-60 Hz).